The reference to "series" is Aussiefrog vernacular. What we refer to as a series 1 car means phase 1, s2 is phase 1.5 and s3 means a phase 2 car. Of course ppl can retrofit rear disk brakes and 15" Speedlines as well as the clear indicators from Series 3 to earlier cars. Could someone please tell me how I can find out all there is to know about Phases and Series for 205 GTI. There is no mention of "series". Other Googling did not help. Thanks for that. Very useful information. Just as a matter of interest, what is the source of it. I have been searching for something like this and just didn't find it. Hi Doug, yes you are right about it changing hands a few times in its later life, I must admit I was a bit worried re this! In its early life it had a couple of long term owners (looking at the paperwork provided) I actually rang one of them to find out a bit more. 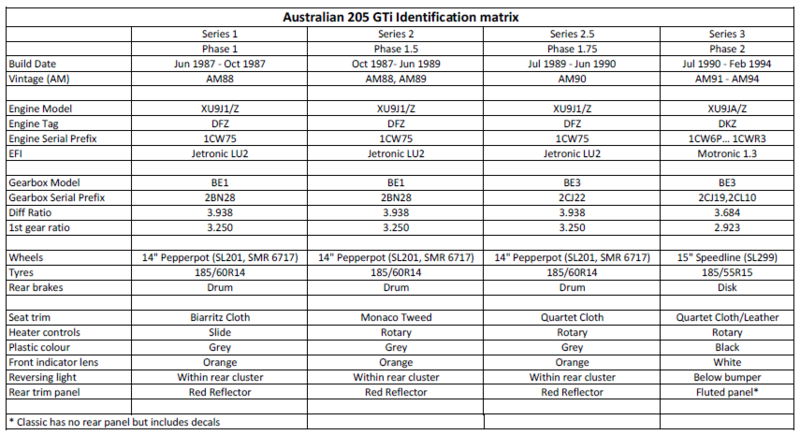 I must admit I hadn't done all (literally none) my homework on 205's and regarding aussie spec ones, i.e. dfz engine/cat. I saw a receipt for a second hand head so got a bit excited, turns out he bought it but never had it fitted, although he told me about the valve stem seals being replaced. Not sure if this head is original or has been skimmed but I am really happy with the performance of the car as I want to keep original as poss. Interesting thing I noticed when I purchased it was that the coolant use to come out of the expansion overflow after a long run (was summer time as well) after you had stopped the engine, turned out the expansion cap was faulty and replaced with correct cap, problem sorted. I was lucky with that as it could have been something worse, so maybe the last couple of owners got the frighteners re that, thinking it was head gasket etc!? Also I never knew there was so much interest in the 205 in Australia, especially in motorsport, and what with the vast knowledge of people on this site (Peter T etc) I don't think you can go wrong with 205 ownership here. I'll PM you as to not to go to off topic for the thread. Pintail, the matrix is based on what has been previously published, the collective wisdom of the AF fraternity and my own research. I also provided Tim, who runs the ClassicRegister site, with some detailed info on the AU spec GTi's. The Phase 1.75/Series 2.5 is my own invention to distinguish this transition AM90 vintage... guilty as charged. You always have to keep in mind with the UK (and Euro) references that our Series 1 and 2 (and 2.5) GTi's were based on 1.6 GTi's with a DFZ engine stuffed under the bonnet. Another difference across all of the series is that Australia is deemed as a HOT climate market and so we had A/C, twin speed/dual rad fans and the oil/water heat exchanger installed as standard. We also got electric windows as standard as well. [QUOTE=ng850;1591341]Pintail, the matrix is based on what has been previously published, the collective wisdom of the AF fraternity and my own research. Here we go... S2 red 205 GTI restored by Australian Peugeot Distributor Sime Darby. Looks very good but it has the wrong seat material and it came with clear driving lights not the yellow fog lights. Cars creeping back up to their original new price, eh? ooooh jeez your right! Better wait until another much better one pops up, any day now..
'generation 1' indeed... shakes head. Clear driving lights were on the S1 I have one from new. Never yellow. Yes, I bought one new in August 1989, hence my comments about seat trim and lights. Given it was restored by the Peugeot Distributor you think it would be 100% correct. Ignoring my OCD observations it does look immaculate and is probably a good buy. This GTi was discussed on another thread a year back. Most of the restoration, including the seats, was done by an owner in WA before it was bought by S-D who then did a bit of cosmetic work. The yellow driving lights are a Euro spec version afaik. Do you have a link to the forum you refer to? It was on this forum Tim. The cosmetic work done by S-D included fairly crudely painting all the grey external trims in an incorrect glossy black. It's a pretty car, but we are definitely not talking about a fastidious factory restoration. If you've got that money to spend on a nice 205 at the moment, I think you would be much better off bargaining down the price of the reasonably nice S3 that is on Carsales at the moment. That SD car is far from original. The S3 on carsales is fair game. The SD red GTI is definitely restored, with lots of effort and $s gone into it, just some areas not purely original. Lots of 205GTI people wanting pure originality especially when asking a premium price. For me the biggest issue at that price point would be the grey external trim, and what is it like mechanically? I do agree the grey S3 car from NSW is worth perusing, I wonder what work it needs done apart from that bumper trim. Its a mates car. Ive been holding off getting involved. Its a very complete car and has had quite a bit of recent work done to it. It needs attention to the paint and some minor stitching on the seats. Mechanically its very good and shouldnt need any work as far as I know. If it can be had for 15k its a bargain as all the hard stuff has been done. (Bushes, rear beam, shocks etc). The car has the red trim with it along with a couole of other bits. Hes too lazy to do it himself and is currently too busy be bothered with it. A good time me thinks to offer him something! CEyssens and gsowner84 like this. gezza and SilverGTi_6 like this. Looks good for the price. Assuming it's running etc - No mention in the ad. Maybe it’s just me but I can’t recall many of the high priced gti offerings over the last few years having reconditioned engines? All the major parts you’d replace are available: liners, rings, bearings etc, and it’s not that hard to get an 8v head reconditioned and give it a light skim. Sure it costs money, but the whole point of these cars is how much fun they are to drive when they’re in top mechanical condition isn’t it? Those cars you've seen selling for top money don't get driven too often and I doubt the owners buy them for that. They are just dead cars as far as I am concerned waiting to rot away in some barn and be discovered on youtube 50 years from now. I expect therefore they would have all the problems of a car that stands too much and would need rubbers replaced, the matrix core, brakes refurbished and so on.